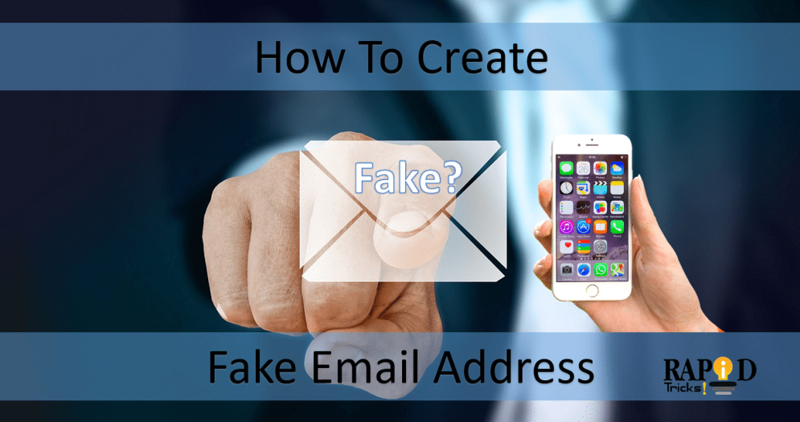 Wondering how to create a fake email address? Well if the answer is yes, then we are here to help you out. As you read further in this article we will be sharing some of the names of fake email generator. Also, we will provide you with a detailed guide to those fake email address generators. So you can create a fake email address. In this article, I will tell you about all the best online tools to generate a free temporary email address for temporary use. So before starting the list of best email generating sites, first I would like to tell you why and when you need a fake email address? We all know sometimes we don’t want to use our real email address on a site which does not look authentic or secure. In this case, online fake email generator helps us to create a temp email address. Well, we often feel a need for a fake email, sometimes to access an unauthentic website. Or to create some social media accounts for a temporary period of time and sometimes to get access to a trial of a web service. No matter why you want to make fake email accounts this article surely going to help you out. So let’s just head into the topic without wasting much of the time. At first, we have the Mailinator it is one of the most popular fake business email address generators that exist on the internet. Also, it is supuser-friendly and easy to use. The good thing about the Mailinator is that you do not have to sign up using your own email address in order to use the fake email address generator service. Or you have to pay any charges to use the website. It is completely free to use, however, if you need extra features like privacy protection, your own private domain, or storage to store your emails then you have to upgrade your plan. But as long as you are going to use a fake email for a single time you do not have to spend a single penny. So now coming to the question, how to create a fake email with the help of Mailinator?. Well making a fake email with the Mailinator is easy. Just head over to the www.mailinator.com and enter your desired email address with your preferred domain extension and click on go. Now you will get redirected to the inbox. Now, remember one thing once you close the tab the fake email address will get deleted. So make sure you are getting done with your job before closing or refreshing the web page of Mailinator inbox. Up next we have the Fake Email Generator. It is also one of the easy to use and popular websites that offers fake emails that work with efficiency. However, on this website, you will get to see a few ads placed on different sides of the page. Also unlike the Mailinator, it does not comes with any premium plans. So just in case if you are looking for a fake email generator with reliable support then you better go with the Mailinator. However, if your goal is to get an email address from fake email generator you should definitely consider using the Fake Email Generator. So how to use Fake Email Generator? Well, the process is quite simple. All you need to do is visit the www.fakemailgenerator.com and you will get a box. Now simply add your desired email address name and choose your preferred domain extension from the drop-down menu. Now simply click on the copy button and the email address will get saved to your clipboard. Also, Remember one thing that the website will not take you to any inbox like Mailinator does. So once you are done copying the fake email address simply visit the desired website where you want to deploy the fake email. Once the desired website sends any mail to the fake email address you will get to see it on the Fake Email Generator page. Also, remember that refreshing the page would terminate the existing email address. Maildrop is also a great temporary email address generator that exists on the web. The website is completely free to use also it is not filled with too many advertisements. All of the ads are placed nicely and they do not even bother the user experience. Also, it does not provide any premium plan to store your fake email address data. So that means once you close the tab you will lose the fake email address that you have generated using the Maildrop. Now let’s talk about how can Maildrop help you in making a fake email? Well, the process is very simple and not so confusing like the Fake Email Generator. Simply head over to the www. maildrop.cc now on the top bar you will get a bar where you have to enter your preferred email address name. Once you are done entering the email name click on go and you will get redirected to the Inbox. Also, remember that the Maildrop does not let you choose email extension like the way Fake Email Generator does. The default domain extension is the maildrop.cc. Also just like any other temporary email address generator once you close the tab you will lose the mail address. Just in case if you want to send an email with fake address then dead fake is definitely a great option. It is easy to use and completely free. However on the website, you may notice too many advertisements, however, it will not ruin your user experience. Now talking about how to send an email with a fake address with the help of dead flake? Well, it is easy all you need to do is head over to the www.deadfake.com. Once you are on the website you will get to see a create email box. Simply enter your already created fake email address and then you have to enter the receiver’s email address. Now on the next box, you have to enter the subject of your email. Then on the next box, you have to enter the message that you want to send. At the end, you have to fill up a captcha and click on send. That’s it now the website will deliver your mail to the receiver. Up next we have the Email Fake it is an alternative to the Fake Email Generator. The website works the same way as the Fake Email Generator. Also, you will get to see some ads on the website. So in order to use the Email Fake at first, you have to visit the www.emailfake.com website. Now on the page, you will get to see a box where you have to enter your preferred email name and then you have to choose the preferred domain email extension from the drop-down menu. Once you are entering and selecting the domain name and its extension hit the enter button. Now simply deploy the fake email address wherever you want and whatever emails you will receive you will get to see them on the Email fake website. Coming to our next suggestion, well for this we have selected the Temp Mail website. The website works quite differently than all of the fake email generator websites name listed above. The website is filled with some advertisements and it is completely free to use. The interesting part of the website is that you do not even have to create a fake email. Then the question is how to create a fake email using Temp Mail?. Well, whenever you visit the website you already get a pre-created email address and a mailbox. All you need to do is simply copy the email address and deploy it and you will start receiving the emails. However, you cannot choose your desired email address name. So don’t forget to have a look at the www.temp-mail.org website. Yopmail is an alternative to the Temp mail. It works exactly the same way as the temp mail, however, there are a few little changes. Also, the website is filled with advertisements and completely free to use. Just like the temp mail, the website does not let you create your desired fake email address name. So all you need to do is visit the www.yopmail.com and on the first page itself you will get a pre-generated email address. Simply copy the address and deploy it. Also, you have to click on the check mails button in order to check the received emails. So that was all for the top websites to create a fake email address. Well, apart from the above-listed names there are so many other websites that help you in making a fake email address. However, the above names are reliable and trusted and used b so many people around the globe. Also, you need to remember that these fake email generators do not provide privacy. So just in case if you want to use a fake email address for illegal activity then there is a chance that you might end up end up being in illegal activities. However, as long as you are using the email address to create get access to websites like Netflix you are safe. Also if you have any questions then you can comment below and we will surely help you out.